Our apologies but , we shall not be open during 2017 as we are carrying out renovations to the properties. The Welsh Retreat is a place of space, freedom and comfort; whether it be for work or play. 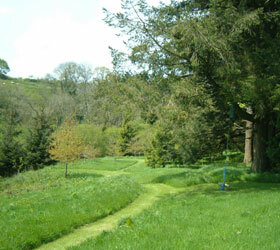 Nestled in beautiful West Wales set in 24 acres of lush land with 6 acres of bluebell woodlands alongside the small River Bargoed; there are many special areas to wander for quiet moments of contemplation or play. The accommodation available is a self contained cottage attached to our farmhouse, the renovated barn which is run on ecological principles, a timber Bunkhouse which overlooks the meadow and during spring and summer we have a beautiful new Yurt for extra accommodation or as another yoga/meditation/ workshop space. In the Barn hot water and all rooms are heated by a central thermal store, fed by the wood burner and solar panels. It will be part of your eco friendly experience to light and stock the wood burner. 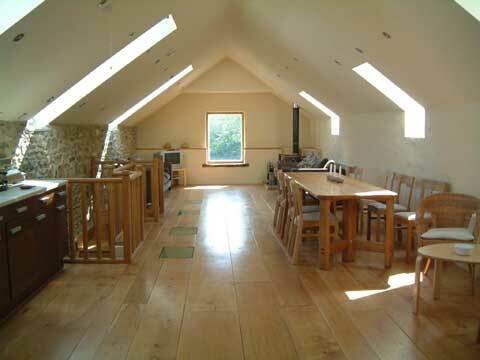 Whether you are running a Retreat or having a Holiday – The barn is designed for group accommodation with a separate space for facilitators or tutors in the cottage. Larger groups can also be accommodated in the Bunkhouse which has it’s own shower and toilet block. You can hire our light airy studio to run workshops, classes and rehearsals for art / music / yoga / writing etc. and during Spring and Summer the Yurt for extra sleeping capacity or as another workshop space. Our maximum capacity is 30 when the Yurt is up and when the Yurt is not available our maximum capacity is 22. Many retreat groups extend their practice into the land. In the grounds there are areas for you to sit around a bonfire, an open roofed firebowl circle or barbeque area and in the meadow are 4 mowed camping circles to pitch a tent or have a circular meditation on. The woodlands and river give you spaces to connect with nature. Or simply come and stay for a reunion with your family or friends. 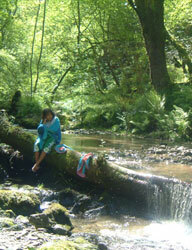 The Welsh Retreat has a beautiful spirit waiting to embrace you. We are an eco friendly and gay friendly business.